Leaving Florida behind was the “official” beginning of our 2019 westward migration. We started earlier this year than we did in 2014, and moved more quickly through Alabama and Mississippi. We’d learned our lesson on that last trip at the end of April – the tremendous thunderstorms we rode out one night near Pensacola still hold the record for dumping the most rain there in a 24-hour period. Our stop at Dauphin Island was a bit out of the way, but we wanted to visit one of our favorite islands one last time. We were looking forward to our third visit, the first being in March 2013 and the second in March 2014. 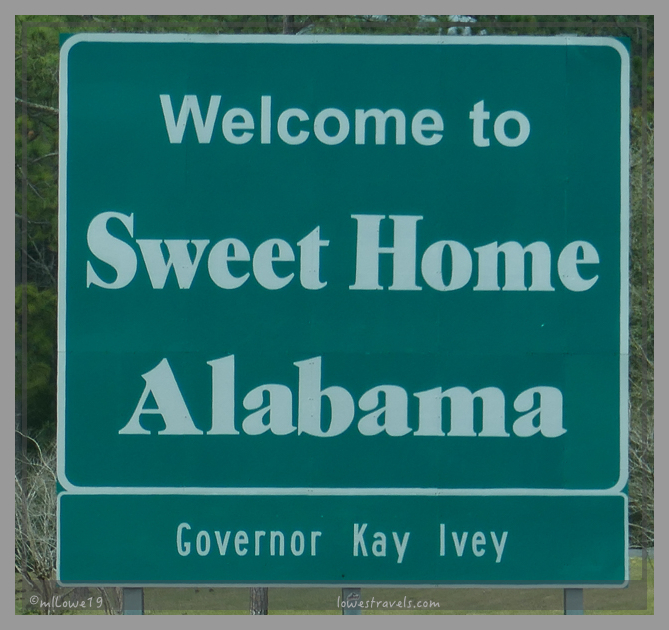 And why, you may ask, do we love this little island in Alabama so much? Well, for one thing nothing has changed much since our first visit here. The bakery and seafood markets are still running a brisk business, and the laid-back vibe and slow pace lifestyle can still be felt. 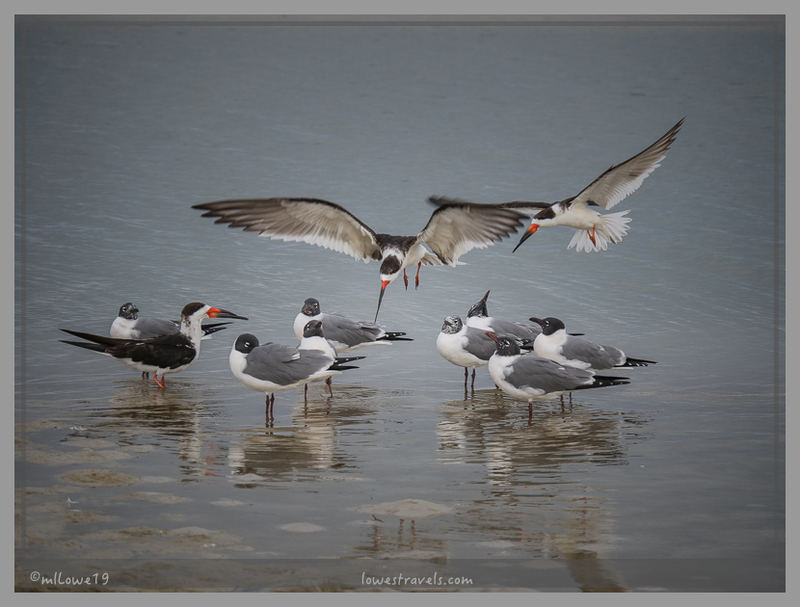 Although it must certainly be busy during spring break and the summer months, we love hanging out at this time of the year to check out the birds and live on “island time” for a while. 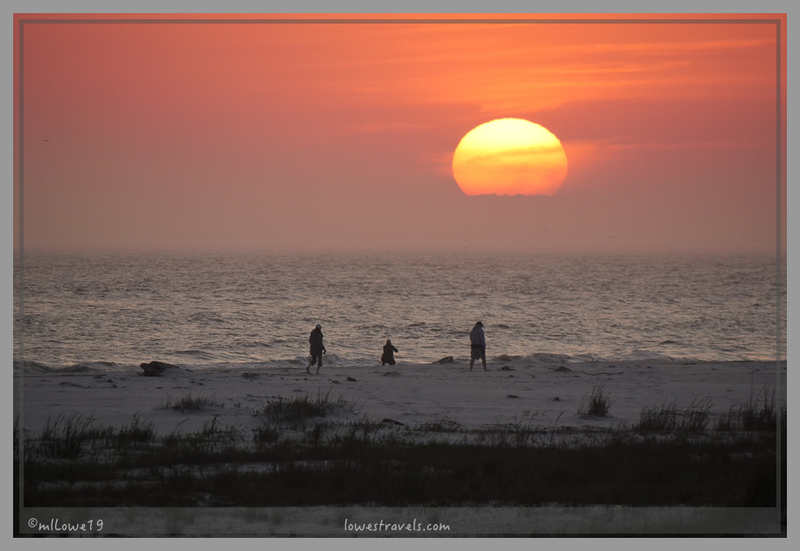 My first post in 2013 described Dauphin Island and what we explored then. At the eastern point is Fort Gaines, and history buffs may be interested in this post about our visit there. The only deviation from our previous visits was the dense fog that periodically enveloped the island on several days this time. But the birdies, awesome food and nice long walks on the beach certainly didn’t disappoint! Many of our feathered friends make a migratory stop on the island every spring, and our second visit in March of 2014 happened to be a particularly good time to see neotropical migratory birds we’d never encountered before. Check out those travel-weary but oh-so-cute and colorful birdies here. And because it was such a birding bonanza, I happily tagged along with Laurel and Eric during that stay as we sighted even more new birds. We were a bit early for spring migration this time, but we walked again at the Audubon Sanctuary to see if the resident Great Horned Owl had new babies. There was indeed a cute little chick, and we wondered if this was the same owl we first saw six years ago, since they normally return to the same nest each year. The foggy weather added to the slowness of time and didn’t hinder us as rain can. It was always warm and we just waited for the fog to lift before enjoying our outdoor activities or heading over to Skinner’s Seafood Market for our daily seafood fix. We were also very happy to learn about the crab omelets served at the Lighthouse Bakery on Sunday mornings – wow! That one was worth waiting in line for. Daily lunch to go – let’s get home and open those cold beers! Steamed Red Snapper – life is good! As time permitted, Steve was able to replace our failed icemaker – what a handy guy! 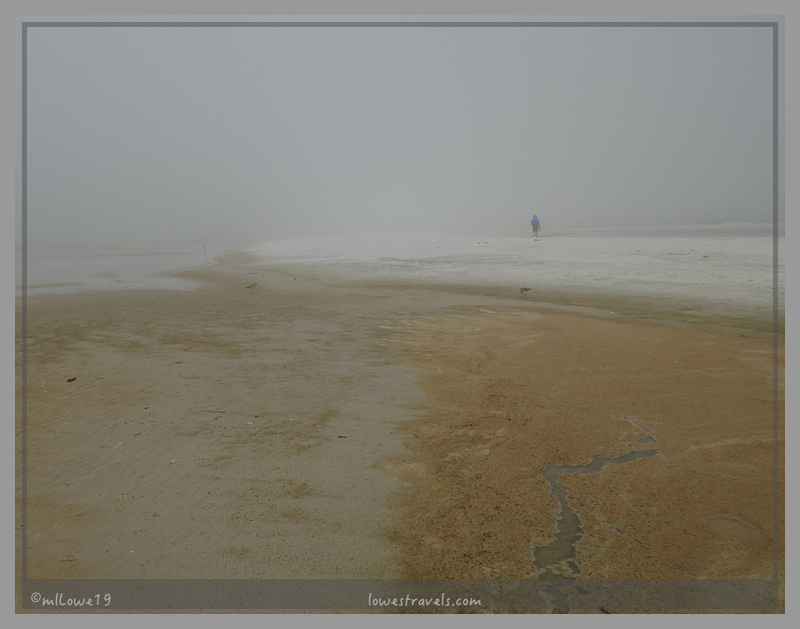 When the fog lifted we simply crossed the road from Pelican Nest RV Park to stroll along the public beach. We also enjoyed a 7-mile drive to the west end of the island, which we had previously taken on our bikes. Another day I ventured to the beach hoping to snap a picture of the skittish Reddish Egret. While doing so I got a text from Steve; he was on the pier watching some amazing cloud formations roll in. I stood transfixed watching them as the temperature dropped and the wind picked up. We did a fast-walk back to Betsy, but fortunately this little storm passed east of us. The end of the clouds dumped rain to the east – they missed us, yay! And with that we bid goodbye to our favorite jewel of the Gulf Coast that has captured our hearts. What a fantastic place. 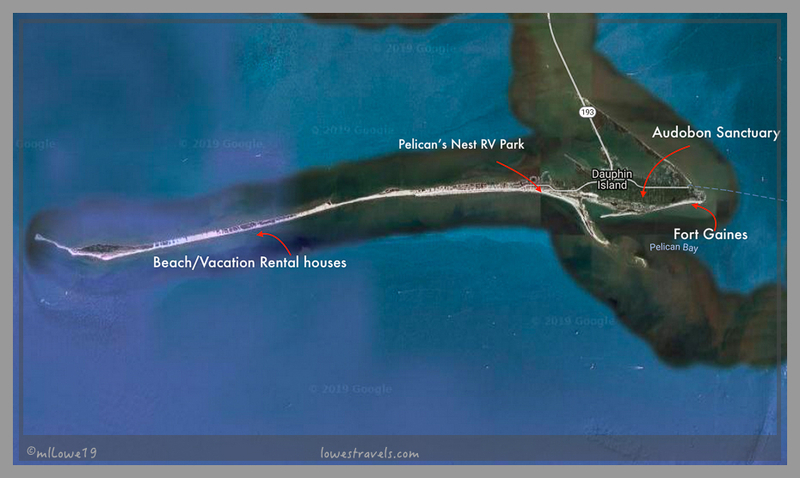 We ran out of time when we were in Alabama in 2013 to add Dauphin Island to our itinerary. I guess I’ll just have to make a point of going back for a visit. You’re making some great arguments for us to stop there in our way west next year. It certainly looks beautiful and I love all the great seafood you can get in such a relaxed environment. Those clouds were incredible. Mother Nature does not mess around, does she? Some great cloud and sunset photos, we enjoyed our day on Dauphin Island but we were to early to see any birds at the sanctuary. Yup, us too we were still too early, but we want to be west of Mississippi River by April so we only had five days there. I can definitely feel the laid back vibe from your post. Love, love the pictures of the mama and baby owl! And oh my, those cloud formations are amazing! And, the seafood looks yummy! I sure hope the next time we head east ( or back west ) this can be a stop. I never knew about Dauphin Island! 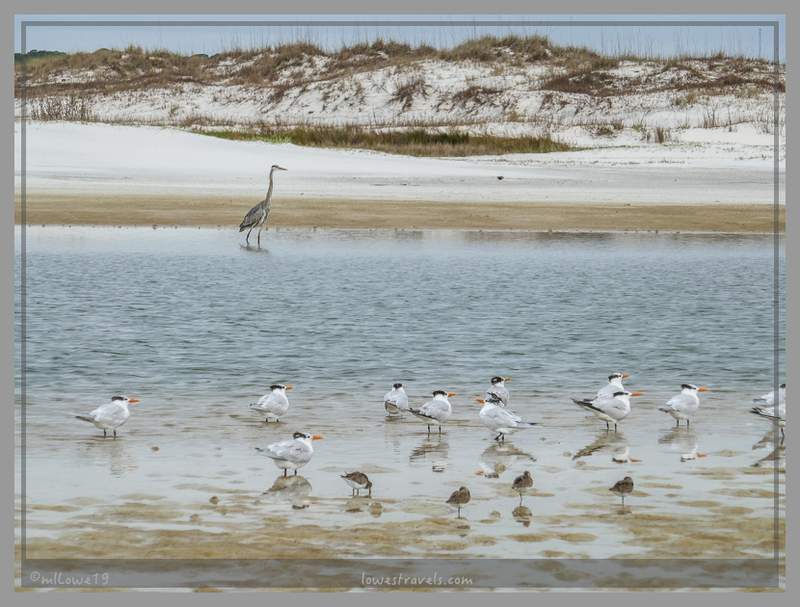 If it happens to be March/April or fall months, you will love Dauphin Island for the birds! 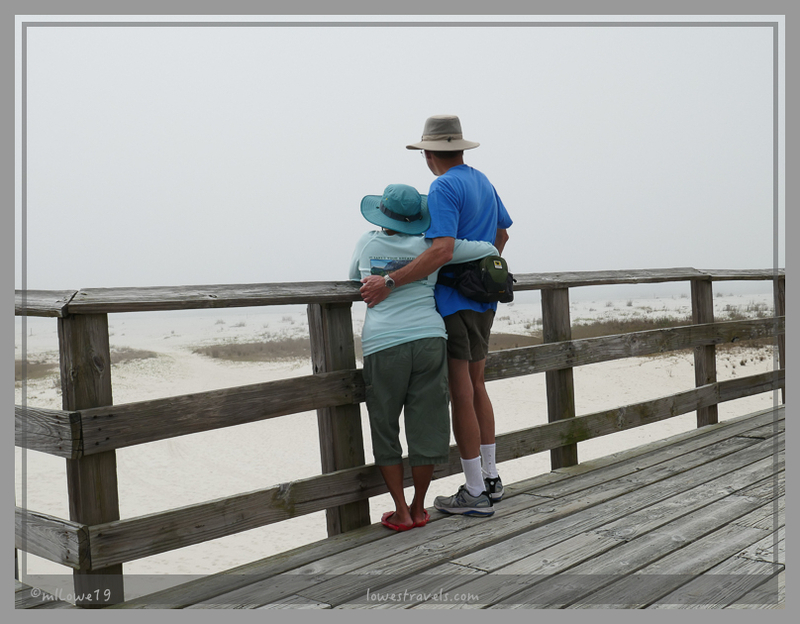 We really savored our final visit at Dauphin Island even if we were fogged. Those clouds were really incredible, but glad it went the other way I would be in trouble, for I was far away from shore. Oh, so fun to see you back on Dauphin Island! We have such great memories of our day of biking and birding there with you (you were such a wonderful tour guide!) and we loved our time birding with you at Fort Morgan, too. I’ll never forget those Painted Buntings. Great photo of the skimmer, and so sweet to see the owls are still nesting in the same place. 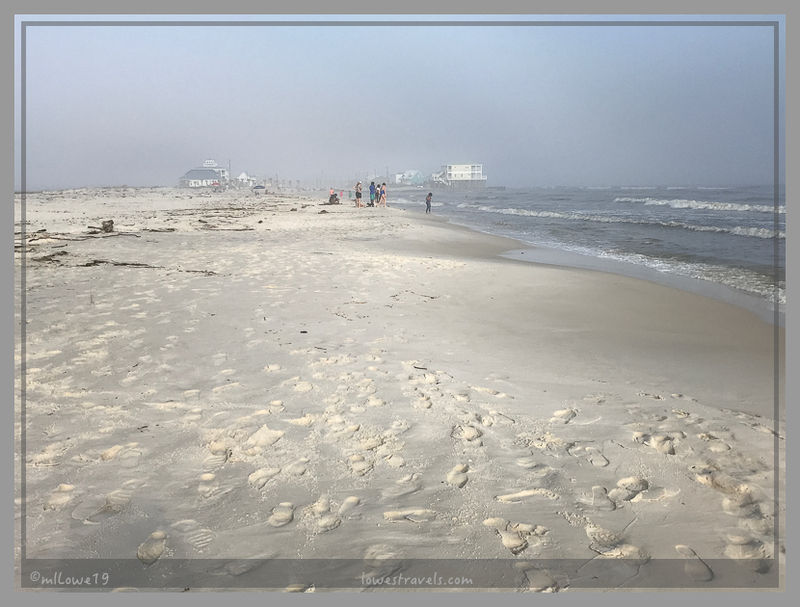 We’ve been to Dauphin Island twice, and you’re making me want to go back again! But I’ll miss you. The gulf coast is the only place we got those crab claws and I always associate it with our birding/biking in Dauphin Island. Fond memories! Another wonderful post. We definitely have to put Dauphin Island on our to do list. 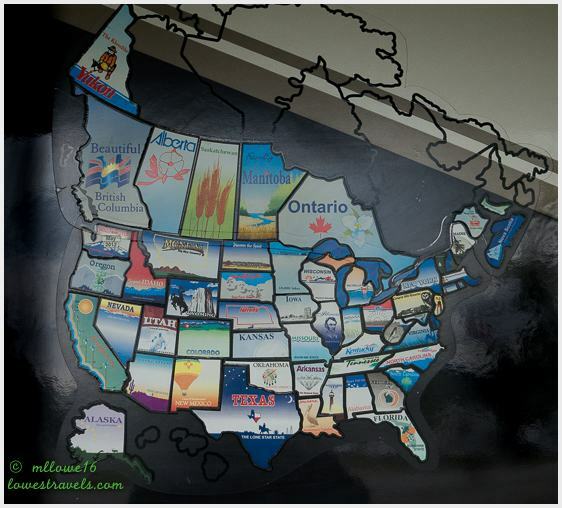 When we go west this spring we will probably go a little farther north this time but I am sure we will head back toward FL at some point. That should give us an opportunity to visit Dauphin Island. 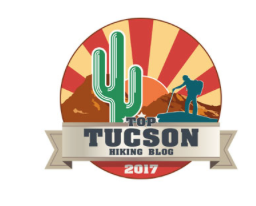 I am already starting to read Steve’s reviews of campgrounds along the route as we are looking to head west basically the same way as you came east in the Fall. Thanks again. Glad that Steve’s reviews are of help to your planning. I was really hoping we could have met up in Florida but we were on a different tract this winter. Wish we could have met up as well. We are going west again so perhaps we can meet up there. We will keep an eye of your stops. 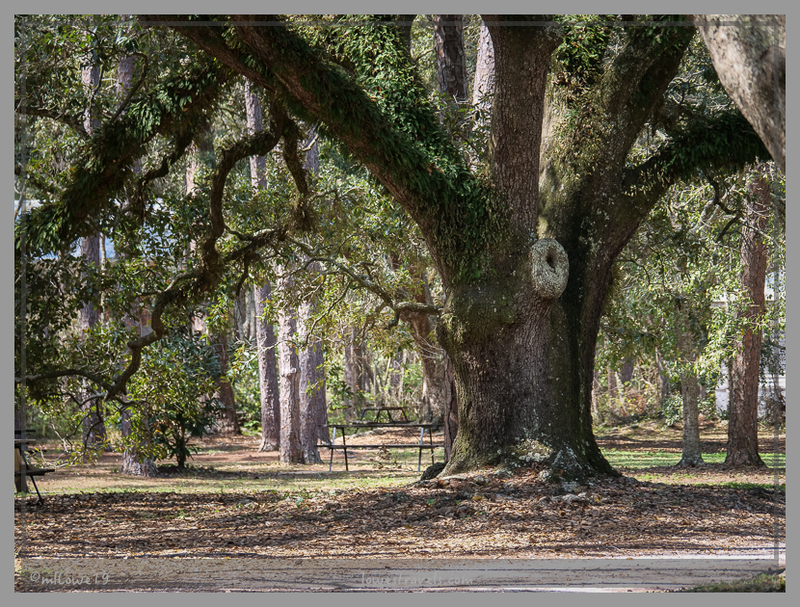 Oh Debbie, Dauphin Island is just one stop for birding, you would love the rookery that we had been too. Lots of opportunities to snap pics of those darn cute birds. 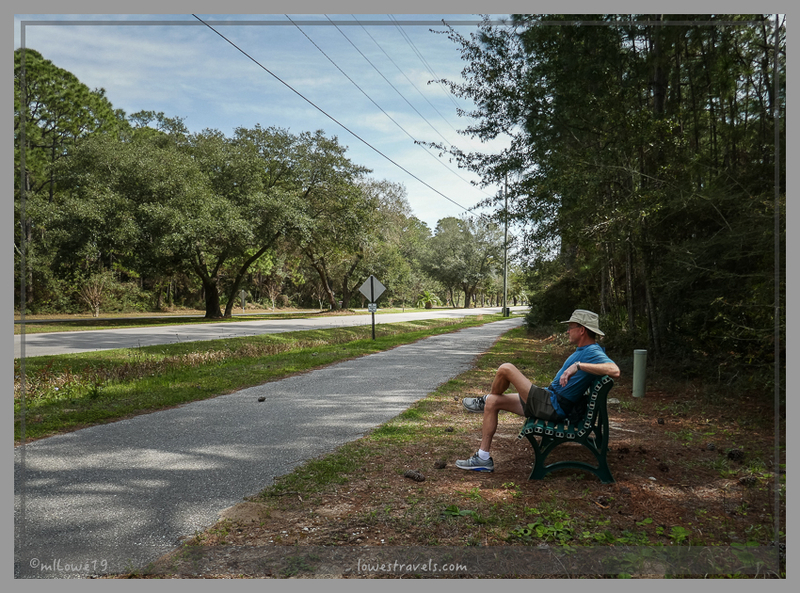 Love the picture of island traffic and Steve’s relaxing pose! You both were lucky in your bird pictures, especially the osprey and the owl. 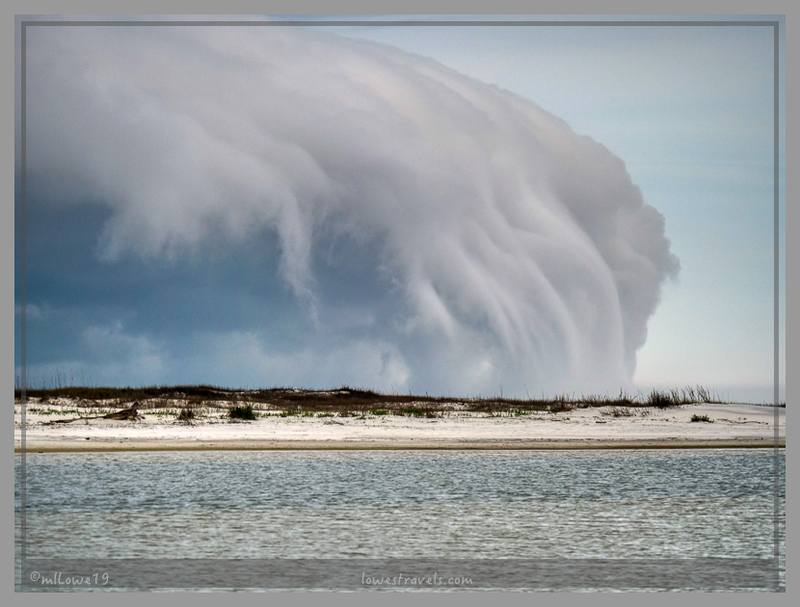 I’m fascinated by unusual cloud formations and the ones you saw were fantastic…..did you ever get any weather from them? I can feel the vibe of that beautiful place, your pictures transport. From the first time you posted about Dauphin Island, I’ve been intrigued. Sounds like you were in your happy place during this visit. I have so missed birding this year! I’ll need to look that up! Another wonderful post! your photos, and that tunnel cloud, WOW!!! and the two of you saying Au’Voir to a wonderful island, picture perfect! Thank you, and that tunnel cloud was menacing but it headed east.